Formerly a Teaching Fellow in the Academic Development Program ("ADP") in 2006, Reichi re-joined GGU in 2011 as Assistant Director of ADP. In 2015, as part of the university's comprehensive bar pass plan, ADP was unified with Bar Exam Services and Reichi assumed the role of Director of ADP. The combined programs and services of ADP and Bar Exam Services offer students a wide range of intensive academic support during their entire time at GGU. Reichi has primary responsibility over a comprehensive and rigorous skills curriculum designed to ensure that all students succeed. Reichi's previous experience includes representing children in the dependency system in Alameda County at East Bay Children's Law Offices, where she litigated issues regarding child abuse and neglect, placement, custody, disability, public benefits and special education. Prior to EBCLO, Reichi was a general commercial litigator at Meyers Nave PLC in Oakland and Hanson Bridgett LLP in San Francisco. 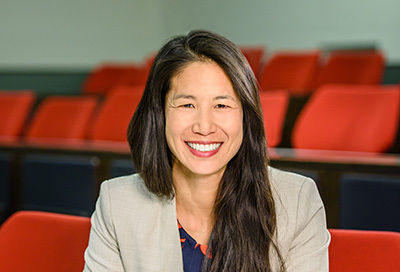 She has taught a variety of courses at GGU, Hastings College of Law, Berkeley Law School and San Francisco State University, including Civil Procedure, Youth Law, Dependency Law, Legal Analysis, Legal Methods, and Legal Research & Writing. Her academic research centers on children and the law and education. In March, 2017, Reichi Lee was awarded the AASE Excellence Award. AASE, the Association of Academic Support Educators, is the leading professional association for people who work in this field. The award is based not only on nominations from colleagues in the field but also on testimonials from the many students who credit her for their success. Returning to the Basics: Rethinking the Meaning of “Practice” in Law School, Winter 2014 The Learning Curve 17. Children Aren't Adults, Even When They Kill, The Recorder, 7-17-2012. Association of American Law Schools, Teaching Methods Section, Executive Committee (present). Association of Academic Support Educators, Scholarship Committee (2017-present). Lawyers' Committee for Civil Rights, Legal Services for Entrepreneurs, San Francisco, CA. Volunteer Attorney (2008). Asian-American Bar Association of the Greater Bay Area, San Francisco, CA: Board of Directors (2006-2008), Co-Chair, Employment Committee (2003-2006).